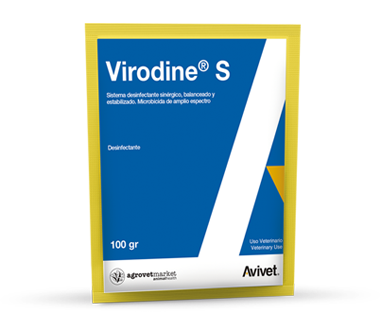 Each 100 g contains: potassium peroxymonosulfate 53 g, sodium dodecylbenzene sulfonate 10 g, sulfamic acid 6 g, sodium chloride 3 g, excipients q.s.p 100 g.
Virodine® S is a disinfectant formulated with organic acids, peroxides, surfactants and a stabilized inorganic buffer. It has broad spectrum, is effective against pathogenic microorganisms that cause diseases in birds, pigs and domestic animals. Indicated for the disinfection of facilities, surfaces, equipment, structures, eggs, vehicles, water and air distribution systems; wheel bath, foot bath, water distribution systems and areas with the presence of animals. Indicated to eliminate: Bacteria: Actinobacillus pleuropneumoniae, Bacillus cereus, Campylobacter jejuni, Clostridium perfringens, E. coli, Klebsiella pneumonia, Mycoplasma gallisepticum, M. hyopneumonia, Pasteurella multocida, Pseudomonas aeruginosa, Salmonella enterica, S. typhimurium, Shigella sonnei, Staphylococcus aureus , S. epidermidis, Streptococcus pyogenes, S. suis. Actinobacillus pleuropneumoniae, Bacillus cereus, Campylobacter jejuni, Clostridium perfringens, E. coli, Klebsiella pneumonia, Mycoplasma gallisepticum, M. hyopneumonia, Pasteurella multocida, Pseudomonas aeruginosa, Salmonella enterica, S. typhimurium, Shigella sonnei, Staphylococcus aureus, S. epidermidis, Streptococcus pyogenes, S. suis. Virus: Avian influenza virus, avian laryngotracheitis virus, vesicular stomatitis virus, Newcastle virus. Fungus: Trichophyton mentagrophytes. Spores and algae. Routine disinfection of surfaces, wood and concrete; routine cleaning and disinfection of portable equipment: 1: 100/1: 200 (5-10 g / L of water), use 300 mL / m2. Disinfection of pediluvios and rodoluvios 1: 100 (10 g / L of water). Disinfection for water distribution systems: terminal disinfection 1: 200 - 1: 100 (0.5% - 1%), continuous disinfection 1: 1000 (0.1%). Aerial disinfection by nebulization: 1: 200 (10 g / L of water), use 1 L / 100 m3. Air disinfection with presence of animals by thermospray: 1: 200 (10 g / L of water), use 1 L / 100 m3. For disinfection of drinking water, 1: 1000 (0.5 g / L).